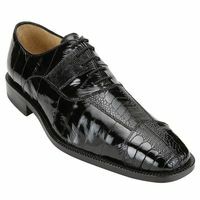 Most self respecting men own at least one pair of gator dress shoes in their closet. A man who has pride in how he dresses has several pairs of dress shoes in his closet. A man who is a potential Jet Setter has some Belvedere Dress Shoes in his closet. Nothing says you arrived more than when step into the room wearing a pair of Real Belvedere Dress Shoes. 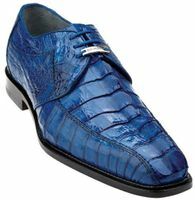 Belvedere Gator Dress Shoes are made of only the finest Genuine Exotic Animal Skins and high quality shell leathers for the sole and heel. 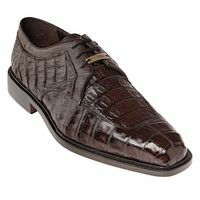 If you're looking to purchase Genuine Crocodile Shoes or Real Alligator,Stingray,Lizard or Ostrich Skin you'll do your feet a huge favor with a pair Belvedere Dress Shoes. 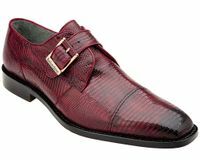 Belvedere Exotic Skin Shoes are Made in Italy with Old World Quality and Craftsmanship that is not readily found these days for purchase. Reviews state that Belvedere Dress Shoes feature buttery soft lambskin lining for uncompromising comfort and cushioned insoles with hand stitched leather soles made with real gator uppers. Most reviews also state that Belvedere has a way with Alligator Shoes that just want you to desire them and not stop thinking about them until you finally buy them. You may have been wearing dress shoes that cost $80 or so for years but always yearned for wearing the real deal. 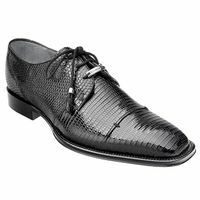 I'm talking about real crocodile skin Italian shoes so Do yourself,your feet and your image a favor and buy yourself some Real Belvedere Dress Shoes. Shop Online Here for more Belvedere Shoes. 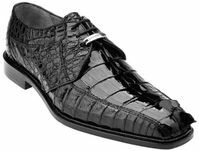 Belvedere Dress Shoes are a leading manufacturer of Real Crocodile Shoes and Mens Alligator Skin Shoes so if you're ready to step up to the Plate and want to buy some real crocodile shoes in your closet, Belvedere Dress Shoes at ContempoSuits.com is the place for you. Read about Mens Eel Skin Shoes Here. Learn How Belvedere Shoes Are Made Here. If you're shopping online for white dress shoes that are heads and shoulders about the rest in terms of style and quality, take a gander at the Monaco by Belvdere shoes. The Olive features pure Italian craftsmanship and style in a white with blue ostrich lace-up that you will treasure wearing. Look around and see how many other shoe makers are copying having crocodile scales on the top of their shoes not paying homage to the brand that made them Famous, Belvedere Shoes. 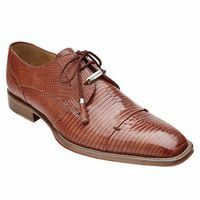 These ostrich skin and Italian calf skin shoes are a conversation just waiting to happen. 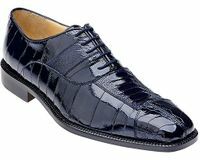 There are Italian style wingtip shoes and then there are genuine alligator skin shoes by Belvedere. Don't get duped into thinking that all loafers are created equal. 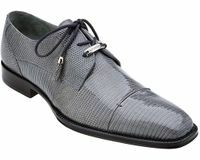 Once you see a pair of Belvedere exotic skin shoes, your mind will change. 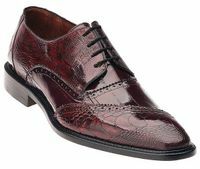 If you appreciate sleek Italian style shoes and bold looking alligator skin as well, The Bosco by Belvedere Shoes can take you where you're going in style. Belvedere Shoes are undeniably stylish. 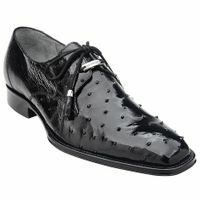 Belvedere shoes have long been making rich Italian design shoes out of ostrich leg skin. The Savanna by Belvedere shoes are no different. See how luxurious these shoes will feel on your feet. 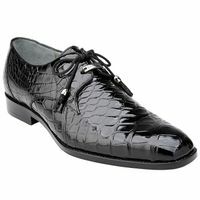 People say that ostrich skin shoes are at the very top of the exotic shoe food chain. Well, these genuine ostrich skin shoes by Belvedere Shoes seem to back up that claim in spades. Featuring a clean styled oxford design with a plain toe, these Belvedere's are sure to impress. 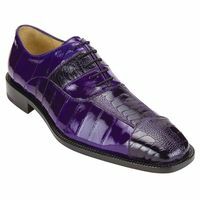 If you haven't bought a pair of Belvedere Exotic Skin Shoes before then you haven't given your feet a treat to behold. Besides the fact that Belvedere Shoes are traffic stopping and luxurious, the buttery full lambskin linings in Belvedere shoes is what your feet are going to notice. Once you buy one pair of Belvedere Shoes, you'll be hooked. Shopping for Belvedere shoes and aren't quite sure which style to get? 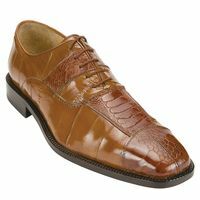 You may want to consider a pair of these fine antique honey tan color alligator skin shoes called the Oscar by Belvedere Shoes. Once you see how the alligator skin just wraps around these Belvedere Shoes you'll be entranced. The Oscar by Belvedere shoes features an Italian lace up design made of the best that a alligator can bring you in a pair of shoes. Take a good look at the sole and heel of these shoes and you'll know right away that only real Italian hand crafted shoes look like these. 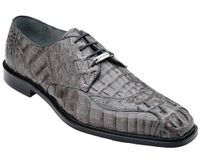 These are Alligator Skin Shoes by Belvedere. The Marco is pure exhibit of Italian design study combining hand made craftsmanship and Italian good looks. 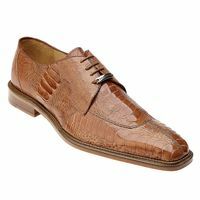 The Olivo by Belvedere features Peanut Tan Genuine All Over Alligator Skin combined with a Classic Laceup Style featuring Hand Made craftsmanship with a full leather lining and hand stitched leather sole that will make you look like a King. 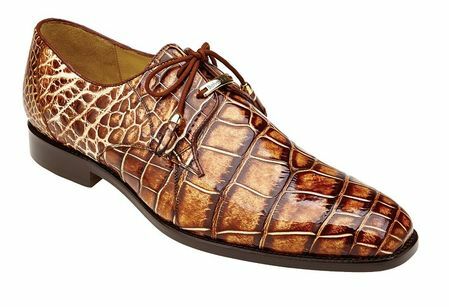 If you're new to the world of alligator shoes, the Lorenzo by Belvedere shoes are an easy way to ease your sense of style into exotic animal skin shoes. The Lornezo with it's clean style is easy on the eyes and won't break your budget. The Lago by Belvedere shoes have been been unsuccessfully imitated by countless shoe makers. 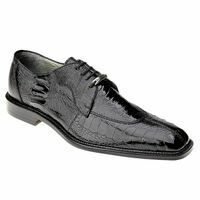 Get the original and official maker of real alligator skin by Belvedere shoes. When you first these all over Alligator shoes by Belvdere shoes, you'll swear that you can see the actual alligator they came from. 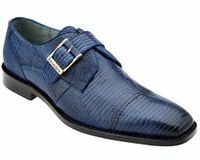 The Lago by Belvedere shoes keeps up tradition by creating only the finest exotic skin shoes that money can buy. If you haven't bought a pair of Belvedere Shoes before then you haven't given your feet a treat to behold. Besides the fact that Belvedere Shoes are traffic stopping and luxurious, the buttery full lambskin linings in Belvedere shoes is what your feet are going to notice. 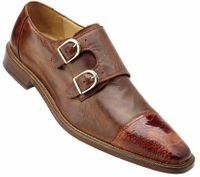 Try on a pair of these exquisite hand made horn back shoes by Belvedere shoes and you'll be immediately hooked on them. The Columbo by Belvedere shoes feature an Italian style laceup of real Crocodile skin that you'll fall in love with the first time you put them on. With real Horn Back skin in a sleek Italian design, the Columbo by Belvedere shoes will be finishing the perfect look you've been seeking. Belvedere shoes keeps exotic skin shoes on the right track. Year after Year. 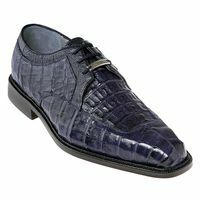 This sleek looking crocodile dress shoe is no ordinary dress shoe but Italian style crocodile lace up by Belvedere shoes. Belvedere knows how to tweak classic shoe style and make them look like nothing you've seen before combined with hand made craftsmanship that Belvedere is known for. Watch how people do a double take every where you happen to be when you're seen wearing these Nile crocodile back shoes by Belvedere. 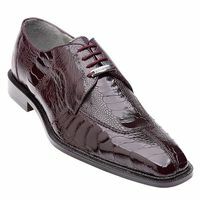 Featuring Crocodile back skin with Eel and Lizard, Belvedere shoes are sure to stoke your ego. If sophisticated style is what you crave, the full lizard skin Olivo by Belvedere shoes is everything that you've been seeking. Watch how the light gleams off of the lizard scales on these Belvedere shoes when you wear them. 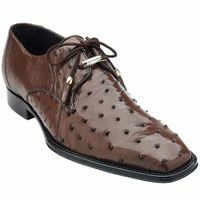 People will know the moment they look down at your feet that you're wearing real ostrich skin shoes by Belvedere. No machine in the world can replicate the natural look of real ostrich. The Isola by Belvedere shoes is cleanly Italian designed shoe made of full ostrich skin that is unmistakable to any other skin around. Let Belvedere step your game up with some shoes that will bring you places quickly. 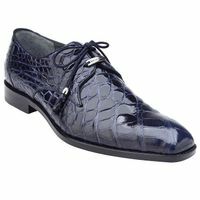 The Karmelo by Belvedere Shoes features Navy Genuine Teju Lizard Skin Cap Toe Italian Styling with a gloss on it that will have heads turning every where you happen to be. It will be hard not to notice people stopping what they were doing to take a look at the Belvedere shoes on your feet. That is the power of the Otto, full lizard skin melange of pure Italian Style. 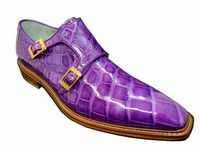 Belvedere Shoes have become masters in the art of making hand made shoes made out of Exotic skin leathers like crocodile and Italian calfskin and the Otto by Belvedere shoes continues this tradition of fine craftsmanship. 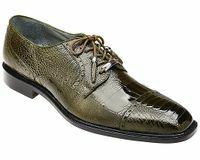 If you like fine exotic skin shoes made of Lizard skin and also like the buttery texture of real lizard skin, you'll love the Otto by Belvedere shoes. Belvedere shoes takes Italian style and exotic skin leathers to new heights. With genuine ostrich skin on top and supple calf skin from Italy on the sides the Salinas by Belvedere shoes are shoes that no one will be able to ignore. Belvedere Shoes are just your your shoe doctor have ordered. 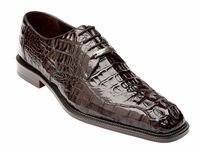 With the unmistakable supple shine of real Italian calf skin to the in your face alligator scales on top, the Bartolo by Belvedere shoes are not for the fashion timid. It takes a man of real style and confidence to appreciate what Belvedere has to offer. Everyone knows that the good things in life are never cheap but every now and then it's good to treat yourself to something special like some Ostrich Leg skin dress shoes by Belvdere Shoes. Belvedere will keep your style satisfied with shoes that are second to none. The Fabio by Belvedere features Genuine All Over Ostrich Skin featuring Hand Made craftsmanship with a full leather lining and hand stitched leather sole. There are Exotic skin shoes and then there are exotic skin shoes by Belvedere shoes like the Marco featuring a unique looking split top style made of all over ostrich leg skin. Belvedere shoes knows what time it is. The way shoes like these are made you can never think that they are just ordinary dress shoes but exotic skin dress shoes by Belvedere. Belvedere shoes are the Luxury item that Men can treat themselves to without a guilty conscience. Made of pure Ostrich leg skin with pure Italian style, you will never regret buying them.